Your chart will be larger, and might just compare the two tablets you’re lusting after the most. Keep in mind that if your lust is still iPad-directed the rumor of the week is that the next version will be announced in January, rather than next April, so buying one for yourself for Christmas may lead to a New Years’ hangover. And then again, next week’s rumor could change that. It’s becoming increasingly difficult to pretend that tablets aren’t hurting PC sales…. David Pogue, the best all-around tech writer today, aslo celebrates ten years of writing about technology for the Times (and many more years elsewhere). 1. The history of consumer tech is branching, not replacing…You want to know what the future holds? O.K., here you go: there will be both iPhones and Android phones. There will be both satellite radio and AM/FM. There will be both printed books and e-books. Things don’t replace things; they just add on. 3. The same “breakthrough” ideas keep surfacing — and bombing, year after year. Some concepts’ time may never come. 4. Nobody can keep up…if you’re feeling overwhelmed, you’re not alone. I’ve been in the publishing business for over thirty-five years and in the tech side of the business for more than twenty-five. Publishing was relatively staid. Tech was always crazy. I’m older now, but everyone I talk to who’s been on the circuit for more than a minute knows that the pace of technology change is still accelerating. If you want to understand the future of publishing bear this in mind. Technology is not a moment, it’s a process. And it’s a process that develops more rapidly than 99.9% of humans can absorb. Which should therefore slow things down. But it doesn’t. 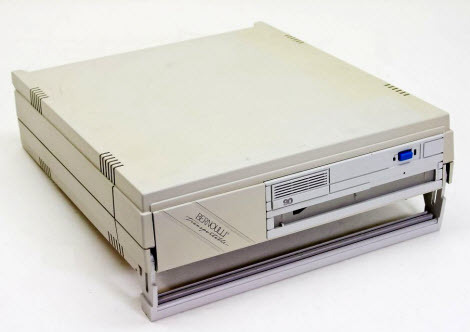 If you can figure out why technology moves faster than people’s ability to absorb it you will be awarded a Bernoulli drive. Vivid words images from the film 60 WRITERS / 60 PLACES. 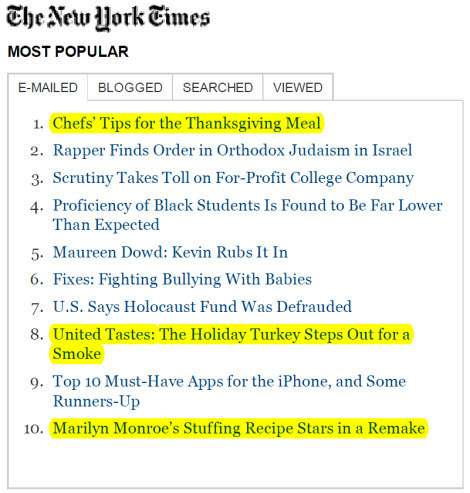 A sign of the times, as it were: three of the most popular stories on the New York Times site this morning are about cooking. OK, we’re all planning our Thanksgiving feasts to be held two weeks from today. But isn’t there anything more important? Oh, yeah, there’s a story about the rapper Shyne, “the Sean Combs protégé who served almost nine years in New York prisons for opening fire in a nightclub in 1999.” And one on the top 10 must-have apps for the iPhone. Meanwhile, over at Publishing Trends, Lorraine Shanley offers a provocative perspective on cookbook publishing on the web: Do Cookbooks Need Apps? In Vancouver the public transit is operated by Translink. There are lots of good things to say about Translink. The buses are clean and fairly punctual and the drivers are generally friendly and helpful, sometimes exceptionally so. The routes are well-planned and the service frequent. The SkyTrains are a marvel of efficiency and comfort. The train service to the airport, launched during this year’s Vancouver Winter Olympics works brilliantly. It takes you to the airport in record time and the price is a bargain. An outcome of Translink’s registration process is that it took me about 20 minutes last week to register, and so I was 20 minutes late for the launch of Daniel Francis’s new book. Yes, if I’d just read the fine print I’d have registered more quickly. But, like you, I’ve now registered for hundreds of sites, I no longer read the fine print, and by default register with an alpha-numeric password, which nearly always works. I was left wondering why a bus schedule website would insist on such draconian security, and posed that question in a comment form on site. 2. Typing your address to find the next bus. A little knowledge is a dangerous thing. Many of the streets in Vancouver are numbered: the major east-west thoroughfares number from First Ave. to 73rd Ave. But don’t try typing those numbers as words, and don’t forget whether the address is east or west. The form on the site tries to make an informed guess. In my experience it usually just gets baffled, or guesses wrong. Then when you finally do enter the right address the system looks for every possible combination of bus routes that can bring you near your destination, with the default sort being total travel time in a moving vehicle. And the best choice is? So, nobody’s perfect, and few websites are. But can’t these problems be fixed? To Translink’s credit, a genuine human telephoned me yesterday to respond to my criticism about the password. I was told that the reason for the complex password is that two years from now the site will link to payment information, at which point the extra security will prove valuable. I did not ask why Translink does not follow S.O.P. and ask customers to change their passwords if and when it becomes necessary to do so. I did take advantage of the human to ask about the buggy address recognition system. I was told that the original programming for the site was very expensive, and would now be prohibitively expensive to fix. Many aspects of the site work well, so why throw the baby out with the bathwater? Hmm. Interesting rhetoric. It’s possibly a plausible argument to make to folks who complain about how tough life can be living in Western countries. “Well, try living in Africa,” some respond. I don’t think the rhetoric applies to websites. If a core function doesn’t function the programmer should be asked to fix it. Someone at Translink signed off on this project perhaps without fully testing it first. They’re $50 million lottery prize winners in a country where the prizes are tax-free. Claude and Kurt Blanchette-Ebert are a month away from celebrating their 30-year anniversary, though they’ve never could afford a vacation to celebrate any of the other 29. They recently lost their house. Claude worked as a furniture upholsterer; Kurt is a master chef who till last Monday worked baking pastries. It has absolutely nothing to do with the future of publishing. I thought it a very happy story and a heartwarming video.